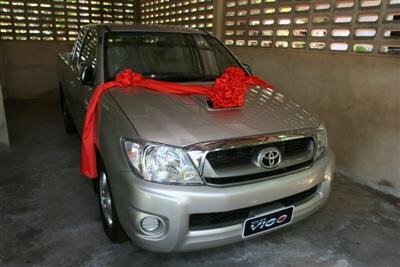 PHUKET CITY: The Toyota Vigo that was top prize in the 2009 Phuket Red Cross Fair raffle is to be auctioned on March 18. The 650,000-baht pick-up remained unclaimed at the midnight deadline on Saturday February 28, prompting the auction. Bidding will take place at the Phuket Red Cross Office on Narisorn Rd. Prospective buyers should arrive at the office at 9.30 am, when the vehicle will be available for inspection. Auction registration will take place at 10 am. Bidders will need to present their identity cards and house registration documents to participate. The winning bidder must pay at least 50% of the price bid straight away and the balance within five days. Anyone interested should call the Phuket Red Cross Office for more information. Tel: 076-211766.